(1) There are two relatively new features in the right-hand column of this page. One is a window that contains my most recent postings on Twitter, and the other is a "Donate" button, which I posted in response to numerous reader requests, to allow ongoing support for my work here (explained here). (2) I'll be on Democracy Now tomorrow morning at 8:00 a.m EST (live video feed here). Over the next couple days, I'll also be on Rachel Maddow's show (tomorrow night) and Morning Joe (on Wednesday morning), as well as a couple of other shows. I'll post exact times on Twitter when I know them (that will be posted in that Twitter window, or you can follow the feed here). (3) On Wednesday, at 6:00 p.m., I'll be at this event at Brooklyn Law School to discuss the flotilla incident. The event is free to the public and includes a dinner with it, and I expect it will be a great event given the panel composition and the substantial Q-and-A session afterward, so anyone in the NYC area is encouraged to attend. 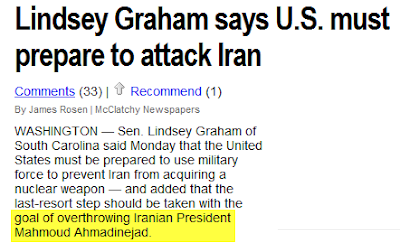 Graham added: "If we engage in military operations as a last resort, the United States should have in mind the goal of changing the regime . . . not by invading (Iran), but by launching a military strike by air and sea." Removing the Iranian Government with nothing but air and sea strikes would require such vast devastation to that country, killing so many Iranians, that its mere suggestion is monstrous. Speaking of "crazy," monstrous people, The Guardian has a good report today -- with a particularly revealing final quote -- on the growing controversy at Harvard over giving an award to New Republic owner and editor Marty Peretz in light of his 20-year record of pure bigotry (and this commentary from Ta-Nehisi Coates is probably the best analysis I've read yet regarding the Peretz/TNR matter). UPDATE III: I had been promoting the Wednesday flotilla event at Brooklyn Law School because I was told by event organizers that it was open to the public. I was just sternly informed by the Dean of Brooklyn Law School, however, that the event is not, in fact, open to the public, but to the law school community only. My apologies to anyone who planned to attend.